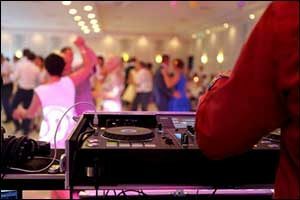 Should You Hire a DJ or a Band for Providence Wedding Plans? You’ve already reserved your South Coast reception hall and said “yes” to the dress, but you still haven’t decided if you want to hire a DJ or book a band for your Providence wedding plans. While a lot of couples get hung up on where to plan Massachusetts or Rhode Island weddings, selecting the vendors who will provide these important services can be just as challenging. Maybe you always knew that you wanted to be a Venus Bride and host a Swansea wedding reception at the world-famous Venus de Milo, but when it comes to details like cake baking, music, and photography, you’re not sure who to hire. Going to a wedding that has a live band is kind of like going to a concert. Lots of great music, dynamic musicians, and tons of fun. A lot of couples choose to hire theme bands that play a certain genre of music to ensure that they don’t get a lot of crazy music that no one knows. Cover bands are also popular, featuring musicians and singers that often dress like and sing songs similar to the originals. If you and your soon-to-be-spouse of a favorite musical genre, singer, or band, consider choosing one of these options for your Providence wedding plans. A live band is much more memorable than a DJ, especially if they are really good. Consider going out to hear local bands play at area clubs and concerts so you can evaluate them in their “natural setting” before hiring them for Rhode Island weddings. It can be difficult to find a live band that will play all of the songs that you want and leaves out the ones that you don’t. Unlike a DJ who plays a set playlist, a live band will sometimes take requests (even when you asked them not to) and might end up playing a song that you can’t stand. Live bands are also much more costly than hiring a DJ. You might want to use that money for something else that you want even more. There can also be some limitations with a live band in that they can only play the songs that they know. A live band also requires more setup space, audio equipment, and the venue may not approve the band of your choice, especially if they are not insured or have a negative reputation in the local area. Speak with the event coordinator at our South Coast reception hall about your ideas for music so you’ll know what to expect. One of the biggest benefits associated with a DJ is that they are often also well-versed and experienced in being an emcee for Massachusetts and Rhode Island weddings. While the singer of the live band could make some announcements, unless they are experienced in this kind of thing, they could ruin some of your Providence wedding plans. DJs are professionally trained and will often have a wide array of musical genres and selections available for you to choose. They also require less space at the venue, leaving you more room for all of your other planned activities and staging ideas. Musicians also need to take more breaks than DJs, so if you want the music to continue right after the best man’s toast all the way to the grand exit, most DJs will be able to accommodate your schedule. They can also assist the planner with announcements and instructions to guests at the South Coast reception hall to make things go a lot smoother. There are a few reasons why hiring a DJ for your Swansea wedding reception. While the DJ might be very cool during the interview process before you hire them, there could be personality conflicts that follow. The best way to overcome this type of situation is to see the DJ in action at another event. This will help you determine how they act in front of a crowd and if there are any issues you might want to avoid. Do this before you hire them or sign any type of contract. Ask for referrals so you can contact past brides and see how they viewed their experience.